Who Is Responsible for the Atrocious GOP Tax Bill? I want to emphasize as strongly as possible that cutting the corporate tax rate from 35% to 20% is a very good idea. It makes the U.S. much more competitive with other developed countries and thereby encourages our multinational companies to bring their foreign profits back home for reinvestment in the U.S. It will also encourage international companies from other countries to set up shop here and thereby contribute to more jobs and better paying jobs in the U.S.
As I pointed out in my last post, the tax plan needs to be revenue neutral to be beneficial. Very unfortunately, the current plan adds $1 trillion to our already out-of-control debt over the next ten years. Furthermore, our currently hot economy (3% growth for two quarters in a row) is likely to overheat from an artificial stimulus of $1 trillion. This will cause inflation to speedup more quickly and force the Federal Reserve to raise interest rates precipitously to head it off. This will lead to much higher interest payments on our debt which, in turn, will lead to a new and much worse fiscal crisis in the relatively near future. I live in Omaha and most of my blog readers likewise live in Nebraska. The Republicans hold a 52-48 majority in the Senate. One Republican Senator, Bob Corker, from Tennessee, has already announced his opposition to the Tax Plan (now in Conference Committee) because he “will not vote to add even one more cent to the deficit.” Thus the Republicans will not be able to pass this atrocious tax bill if they lose even two more votes (fifty votes needed with the VP able to break a tie). If this awful legislation does become law, and Nebraska Senators Deb Fischer and Ben Sasse vote for it, we will be justified in holding each of them personally responsible. Conclusion. The GOP is on the verge of making a very bad mistake. The party with a reputation for fiscal responsibility is on the verge of throwing it away for what will turn out to be a very short term gain. 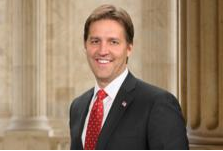 This entry was posted in Ben Sasse, Deb Fischer, debt, deficit, economic growth, Jack Heidel, tax rate cut, tax reform, tax revenue and tagged Ben Sasse, Deb Fischer, debt, deficit, economic growth, jack heidel, tax reform by jackheidel. Bookmark the permalink.